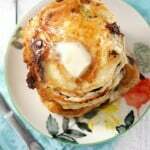 Home » Breakfast » Gluten Free and Vegan Chocolate Chip Banana Pancakes. 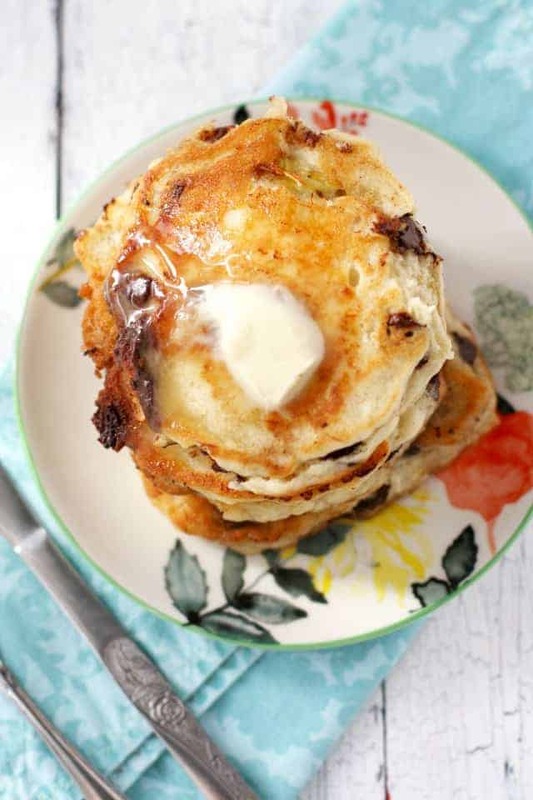 Gluten free and vegan chocolate chip banana pancakes are a delicious weekend breakfast option! Cozy up to a nice stack of pancakes and enjoy a lazy morning! Well, it finally snowed here! It started snowing on Sunday, and it actually stuck! So everything looks all nice and pretty outside now. And we are nice and snug inside, and doing cozy things like making chocolate chip banana pancakes. It can be difficult to make a fluffy pancake with out gluten or eggs. Those two ingredients really make pancakes nice and light and tender. It’s one thing to remove gluten from pancakes – you can still make a decent pancake without it. But when you remove gluten and eggs…well, it gets a little bit tricky. There’s a chance that the pancake will be on the heavy and dense side. Which really isn’t what I’m looking for in a pancake. But…this recipe is fairly easy to throw together, and makes wonderful chocolate chip banana pancakes that taste and feel just like pancakes should. These pancakes start out with a gluten free baking mix by King Arthur. 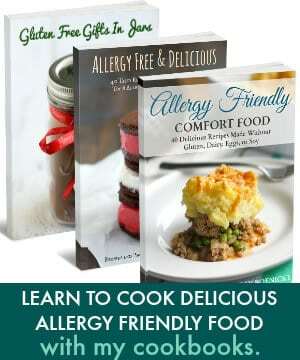 This baking mix is different from a gluten free flour blend because it includes a few other ingredients like baking soda and salt. So if you make these, I would suggest finding this exact mix – that way you know they’ll turn out. 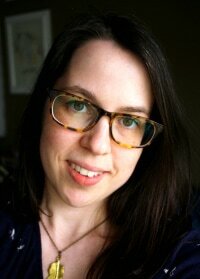 I’ve seen it at Whole Foods, Meijer, Kroger, and other health food stores, in addition to Amazon, of course. 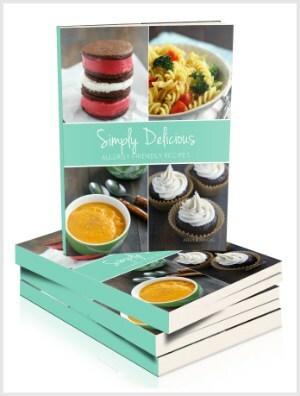 These are such a big hit at our house – my boys love them! 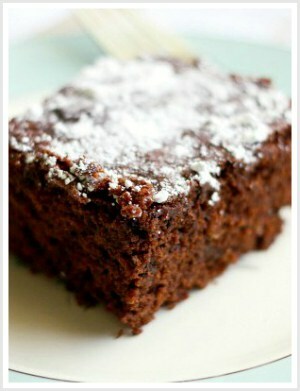 And if you’re like me and always have overripe bananas lying around, this is a great way to use one up. 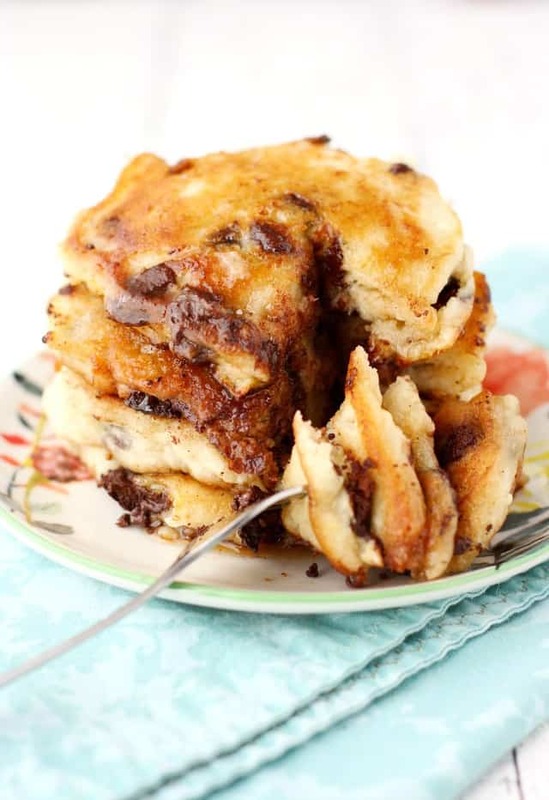 Delicious gluten free and vegan banana chocolate chip pancakes are a wonderful weekend breakfast! Place the overripe banana in a mixing bowl and mash with a fork. Add the sugar and oil and stir well. Add the gluten free baking mix and non-dairy milk. Stir well. Place 1 1/2 tablespoons of vegan buttery spread in a frying pan and heat over medium heat. Once the butter is sizzling, spoon the pancakes into the pan. Reduce heat just slightly, and cook until you see that the edges of the pancake are done. These take a while to cook, it might be about 3-5 minutes before it's time to flip them! Continue to cook on the other side until cooked through and golden brown. Serve with vegan butter spread and maple syrup. Serving size is two small pancakes. « Pasta with Creamy Spinach and Ham Sauce. Have you ever tried to freeze these? Looking for a make ahead quick breakfast. I haven’t, but I think it would work! They are delicious. I did use GF flour and did not add anything. Might have been a bit fluffier possibly but really not missed. I should have added a bit of salt. So glad you liked these, thanks for letting me know! Can I sub the mix for just plain flour? You would need to add some baking soda or baking powder to help it rise if you do that. These look like some seriously good pancakes! 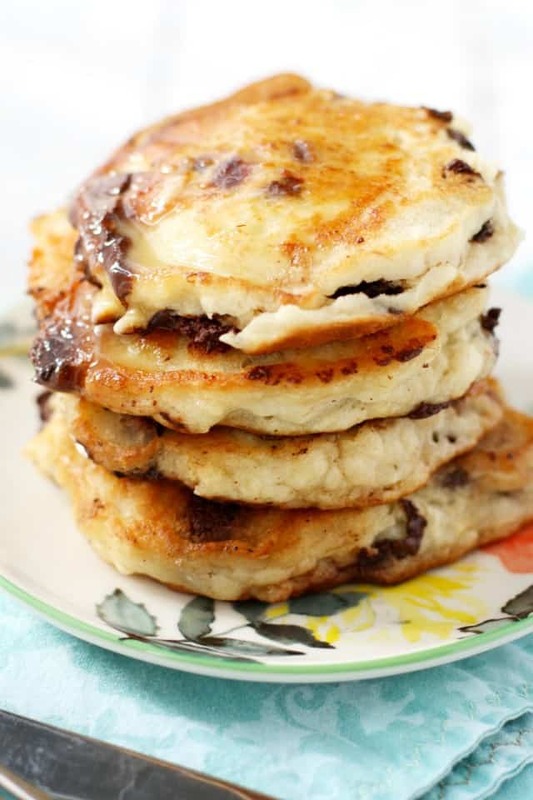 Love the use of bananas and chocolate chips in them! These pancakes look SO good, Kelly! Perfectly fluffy! You completely NAILED these pancakes, Kelly! I’m totally drooling over how ultra-fluffy and thick they look! These sound PERFECT for a Saturday or Sunday morning :) I’m totally craving pancakes now. It needs to be the weekend so I can make these! They look amazing! These look amazing! I’m such a fan of that chocolate banana combo! I was floored when I woke-up to the ground covered with white today! It’s already melting, but ah!! Haha! And classic cakes!!!! We all love chocolate chips! Could chocolate and banana be anymore perfect in pancakes? I think not! These pancakes look delicious, Kelly! I love that you combined bananas and chocolate. Sounds like the perfect breakfast!